The Whiptongue Bulborb (ペロチャッピ?, lit. : "Slurping Chappy") is an enemy in Pikmin 3. It is a member of the grub-dog family, but is different from the others in that it has a long tongue that it uses to slurp up Pikmin. Its tongue can catch up to 5 Pikmin at once, somewhat like the Emperor Bulblax, but quicker and much less destructive. It has a brown face, much in contrast to the paler face of the Red Bulborb, with a long snout at the end that the tongue comes out of, as well as a white body with black spots, and blue eyes. This Bulborb species attacks with its long, flexible tongue, which allows it to quickly devour Pikmin from much greater distances than other members of the grub-dog family. It doesn't sleep when unaware of the presence of Pikmin. Instead, it will rummage through the ground and sniff around the surrounding area much like a Dwarf Red Bulborb. When a leader and/or a Pikmin is nearby, it will quickly shuffle towards them. If the Pikmin are standing within attack range, it will launch its tongue outward as a means of consuming them. Up to five Pikmin can be snagged at a time by this move. However, if Pikmin are standing beside it, or are attacking its feet, it will lap up individual Pikmin one at a time at a slightly slower pace than normal Bulborbs. Just like all other grub-dogs in Pikmin 3, it can be temporarily incapacitated by throwing Pikmin directly at its eyes. The Whiptongue Bulborb can be quite a dangerous foe because not only does it constantly roam around, leaving no part of its body exposed for long, but its long tongue allows it to ensnare batches of Pikmin from a distance. There are several ways to deal with this enemy. The first method is attacking from the rear, much like combating a Red Bulborb. Use a 30+ Pikmin squad comprised of Red and Rock Pikmin and simply keep chucking them from behind. Wait until it has begun sniffing the ground before throwing any Pikmin so that it doesn't spontaneously turn around and proceed to lash out its tongue. If you can keep throwing Pikmin on its back as it shakes them off, it'll be taken out without getting the chance to use its tongue. A surprisingly effective, strategy is charging it from the front with 35+ Rock Pikmin. Just like other Bulborbs, the Whiptongue Bulborb will flinch when its eyes are hit. Take your squad and let it catch sight of you from a distance. As it approaches and gets ready to use its tongue, start throwing your Rock Pikmin at its face. Throwing them at the face is bound to lead to some hitting the eyes, which will make it flinch. Attacking it from the front without aiming for the face however is lethal and will result in you losing a lot of Rock Pikmin to this. If you keep throwing Rock Pikmin at the face in rapid succession like this, it'll have all its hit points drained without even getting a chance to use its tongue, because it will constantly be flinching. Another rather risky method is to get a group of around 30-50 Pikmin, preferably Reds and Rocks, attract the attention of the Whiptongue Bulborb and lead it to the edge of its territory; then, when it's walking away, order your Pikmin to rush it. If done correctly, the Whiptongue Bulborb will quickly succumb to the blitzkrieg, with little to no deaths. Note that this will not be the preferred choice of action if you are attempting a zero-death run unless around 50 Red Pikmin and 30-50 Rock Pikmin are present. Another fact to note is that even though it eats with a tongue, just like with other Bulborbs, if hit in the eye, it'll release any Pikmin it has caught in its mouth and is about to eat. This can be taken advantage of if you are in a pinch and a Whiptongue Bulborb is about to eat quite a few of your Pikmin. You can also take cover in clover patches in order to hide from it. There is another method, which needs only one single Pikmin: using a bomb rock. Luckily, these bombs can be found on a dirt mound near the Whiptongue Bulborb. When a Pikmin is carrying a bomb rock, it can be thrown directly on the Bulborb, or you can leave this Pikmin in front of the creature; it will try to eat the Pikmin, but it'll eat the bomb instead. Afterwards, the Whiptongue Bulborb will explode and die. "Whiptongue" is a combination of "whip" and "tongue", referring to how this creature can lash its tongue around. Its Japanese name is the same as all Bulborbs, but starting with the word "slurping", making it ペロチャッピ? (lit. : "Slurping Chappy"). Its internal name is arikiu, the Romanized word for ありく?, or "anteater". Artwork of a Whiptongue Bulborb from the Official Nintendo Magazine. E3 2012 screenshot of a Whiptongue Bulborb capturing Pikmin with its tongue. A close-up screenshot of a Whiptongue Bulborb revealed in a Nintendo Direct. Red Pikmin hiding from a Whiptongue Bulborb. The group of heroes approaching a Whiptongue Bulborb in an earlier version of the Distant Tundra. A Whiptongue Bulborb being locked-on and scanned. A Whiptongue Bulborb sticking its long tongue out. This picture was taken with the KopPad. A Whiptongue Bulborb just about to attack. A Whiptongue Bulborb scratching itself. Another Whiptongue Bulborb scratching itself. A Whiptongue Bulborb noticing the player. A Whiptongue Bulborb just after exploding. Pikmin carrying a Whiptongue Bulborb in Bingo Battle. In the Pikmin 3 website notes, it states that it's part of the "Bulborb Family," even though the family name is "grub-dog". 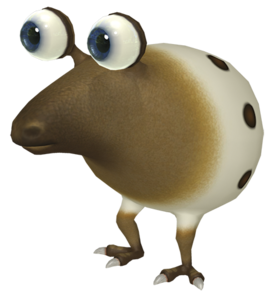 This is the only adult Bulborb to not have a dwarf mimic in Pikmin 3. This enemy is arguably one of the most advertised enemies in Pikmin 3, with others being the Armored Mawdad, Pyroclasmic Slooch, Peckish Aristocrab, and the Medusal Slurker. Unlike its other grub-dog relatives, it may not be nocturnal, as it is found awake in the wild, similar to the Spotty Bulbear in Pikmin 2. However, in the Tropical Wilds, it is seen scavenging for Pikmin during sunset. This suggests that Whiptongue Bulborbs are cathemeral, meaning they are active at both day and night. In the E3 2012 demo, the Whiptongue Bulborb required 10 Pikmin to carry, while in the final game, it requires 12 Pikmin. Whiptongue Bulborbs might have been inspired by anteaters. Both creatures have snouts, and long, sticky tongues to capture their prey with. This page was last edited on January 20, 2019, at 12:08.